Monitoring brand mentions is one of the standard tactics marketing experts use for measuring the success of their strategies. It’s just a must these days. If someone on the internet is discussing your brand, you need to start listening to what they say and participate when necessary. 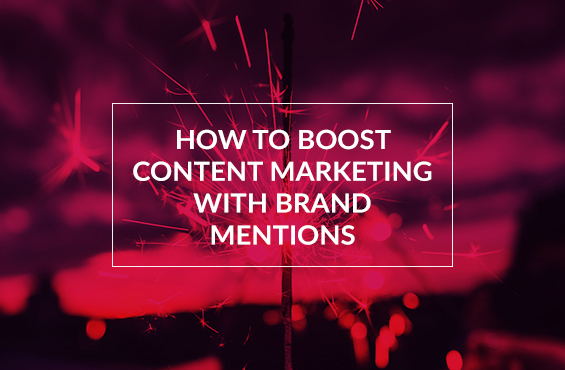 However, monitoring brand mentions can also give you a lot of inspiration for creating fantastic content to power your content marketing strategy. Here are three ways you can transform brand mentions into valuable content assets. One way to boost your content marketing strategy is taking advantage of your marketing channels to drive traffic to content that actually promotes your business. In other words, you will be promoting people who promote you. That way, you will nurture your relationship with audiences who are already actively engaged with your brand and turn them into loyal members of your community. Moreover, sharing that type of content will generate more exposure to the brand mentions you want to promote. Consequently, you will boost your online brand recognition. Make sure that you have the right tools for monitoring mentions in place. It’s also a good idea to have a tool for organizing mentions to use them later. Awario is an excellent source because you can easily sort through mentions and highlight the ones you want to include in your roundups. People who share the content of your brand are helping it become more credible and verifiable. These mentions can be distributed very easily so it’s in your interest to collect and promote them on social media. Take Twitter as an example. Twitter offers features that help in collecting and promoting mentions efficiently. Don’t forget that most tweets are public and open so you can easily share them publicly. You can embed tweets on your website or blog easily. Tracking brand mentions on Twitter can be challenging so it’s best to equip your team with the right tool. TweetDeck is a good choice because it allows creating a dashboard to help your team engage with mentions instantly. By taking advantage of these search modalities, you’ll be able to see tweets that mention your full name and twitter handle, but also include tweets that contain unlinked handle, mention your site or even articles on your site. Whenever you spot a positive tweet, you can add it to your Twitter list to keep all of these valuable mentions in a single place and then retweet them with comments, embed them on your website, transform them into visual material, republish them on other types of social media, or automatically share them with your team through a Slack group or RSS. Consumers love using social media to interact with brands. They feel comfortable discussing products or services in public instead of emailing the business and waiting for a reply which sometimes takes a long time. 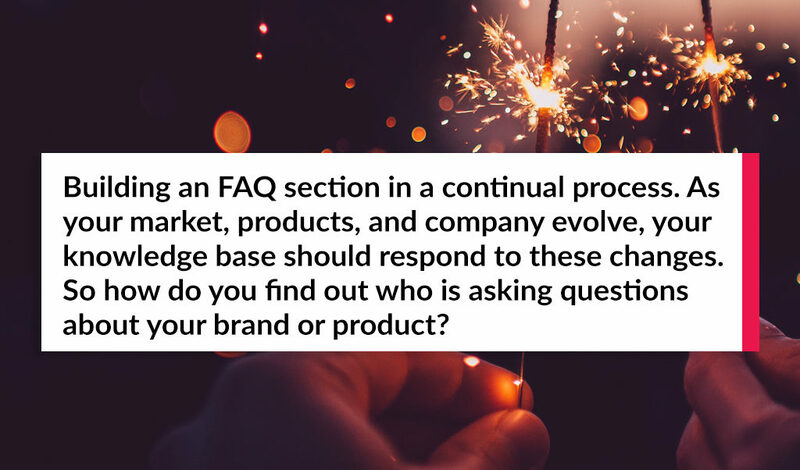 By interacting with a brand publicly, they also help other customers who have similar questions or problems to instantly get the answer. Remember that consumers expect brands to respond immediately. It’s critical to monitor all these conversations to enable your team to address any issues immediately. That way you’ll avoid reputation gaffes, transform unhappy customers into brand advocates by delivering excellent customer service, and make sure that all potential concerns are also addressed on the website. Monitor the brand mentions of your competitors or competing products. It’s essential to learn what your competitors’ customers are asking them about – you can use that information to provide better answers on your website. That way, you’ll also gain an opportunity to attract the customers of larger competitors. For example, Twitter offers a smart search option where you can instantly spot questions users ask about your brand. Typing your search keyword on Twitter and add “?” to immediately get the results you seek. Another tool BuzzSumo Question Analyzer, that allows discovering questions about a given topic by aggregating data from forums and Q&A databases on the web. The tool generates a list of questions about related terms allowing you to expand the scope of your FAQ. Cyfe is another tool you should consider – it works like an FAQ management tool that allows creating an archive of mentions you can revisit once in a while, but also note questions discovered from other sources. By taking a closer look at your social media channels and brand mentions, you can come up with many exciting content ideas that relate directly to what your target audience is talking about. Make sure that you include monitoring-related content in your strategy. Or perhaps you’re already using your brand mentions to create new forms of content? 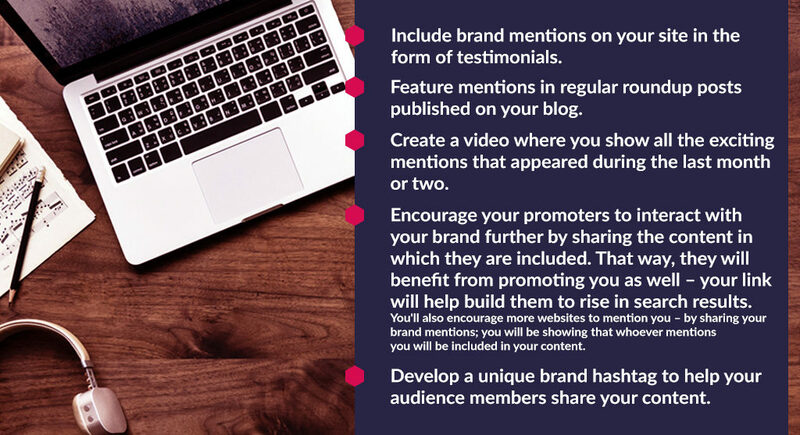 Share your thoughts and experiences in comments to start a conversation about best practices in building brand awareness through a smart use brand mentions.